For the keen cooks and bakers amongst us, there’s nowhere we’re rather be than pottering happily about in our kitchen. Developing a new recipe, putting a purchase through its paces, whipping up an old family favourite… it’s quite the best way to spend an afternoon. But if your kitchen space is more petite than plentiful, finding a place for all your kit can be more of a nightmare than a dream. If you’re struggling to fit everything into a tiny space, or want to make the most of the compact capacities of a caravan or boat, don’t worry: help is at hand! There are all kinds of products out there designed to make the most of what space you do have, and put any ‘dead’ space to better use, so you can cook in comfort. Here are ten of our favourite solutions for the spatially-challenged kitchen. 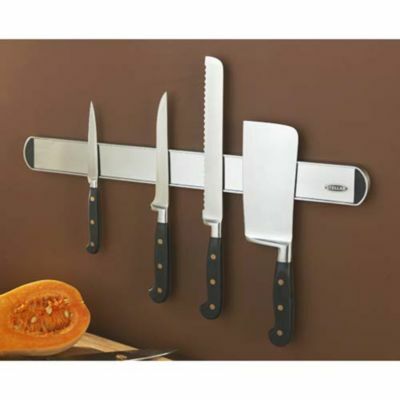 Borrow a great idea from catering kitchens and move your knives out of the drawer and onto the wall. Our Stellar Magnetic Knife Rack will keep your knives close to hand when cooking – a space-saving idea that’s really convenient too. And it’s not just knives – any stainless steel utensil with a flat handle will stick fast, so you can put your favourite scissors, ladles and serving spoons up there too. 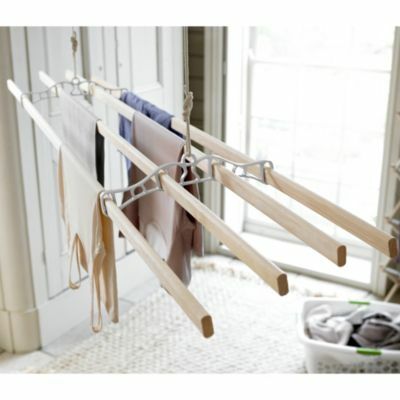 You could of course use our Traditional Airer as a lovely-looking, space-saving way to dry your laundry… or you could hang it from your kitchen ceiling and turn it into a multi-tasking marvel. 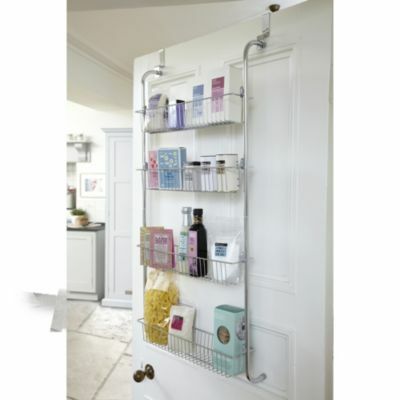 With the addition of some butchers’ hooks you can use it to store any piece of kitchen kit you can hang on a hook, from pots and pans to utensils, freeing up loads of space in your cupboards – and you can stick your tea towels up there to dry too. Save floor space by hanging your kitchen bin on the inside of a cabinet door. The simplehuman® In-Cupboard Bin either hooks over or can be fixed onto a cupboard door, getting it off your floor – and your rubbish out of sight. Making the most of that tricky, barely usable space under the sink, the expandable two-tier under sink organiser is just what you need. Making the most of this cupboard, whichever side your U-bend is on just got a whole lot easier with this adaptable storage solution. 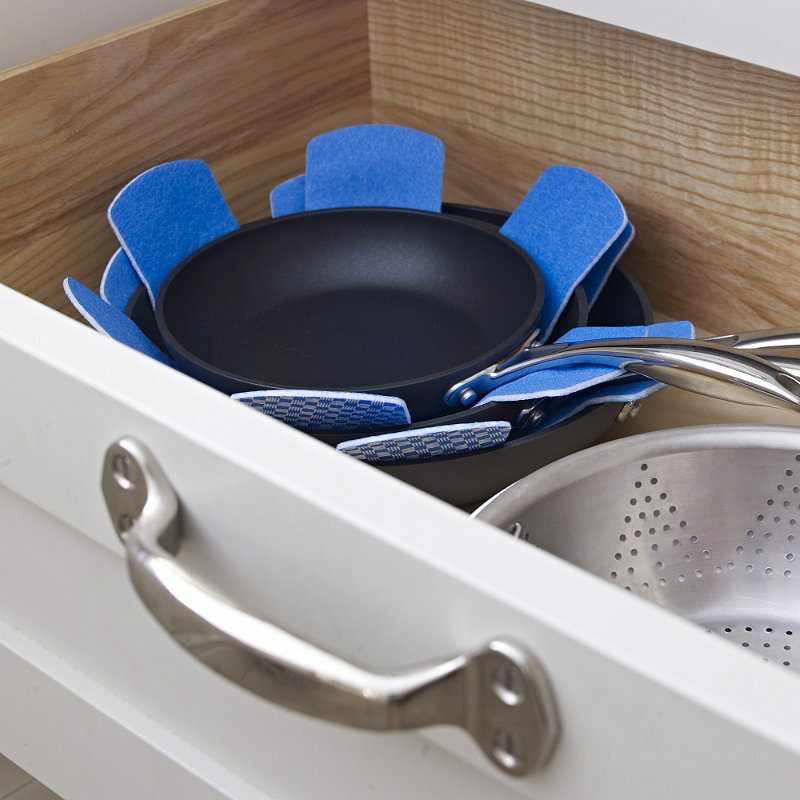 Making the most of teeny cupboards or shelves means you’ve got little choice but to stack more space-hungry items like pans – which is fine, as long as you can do so without damaging them. Our anti-slip Pan Protectors prevent scratches and fit any size from skillet to milk pan – and they come in three colours so you can match them to your kitchen if they’re out on display. Freezer bags, foil and cling are an absolute essential for food storage – but where do you store all your rolls and boxes without giving up a whole precious kitchen drawer? Simple – hang up our Overdoor Storage Rack. It has four wire baskets designed to store all of your kitchen essentials in a way that keeps them close to hand for when you’re cooking, no more hunting in the back of the cupboard for that certain spice! Extra shelving’s an great way to make use of free wall space, but if your DIY skills are somewhat limited or your walls are already doing double duty (they have to hold up the roof too), Adapt-a-Shelf lets you install instant extra shelving in your cupboards or on your worktop. Best of all, between the two sizes available, you can have any shelf length from a wee 27cm up to a whopping 83cm. If you’re still struggling to fit everything into your cupboards, and have a little floor space to spare, a kitchen cart’s a great way to make instant extra storage. Our Chubby Mesh Cart is strong, sturdy and can carry a heavy load – perfect for any overflow of cans, fruit and veg or dry goods – and can be stashed neatly into an under stairs cupboard or below a breakfast bar. Successful baking made easy!Meat-free Monday!